Although it is part of 1972 Series, it was only issued on 8 April 1975 and was already out of print as of 11 March 1980 and replaced by a coin. It features Cathrine Sophie Kirchhoff, née Christensen, married to Councillor of State J. H. Kirchhoff and a female Common Eider painted by Johannes Larsen (1867–1961). 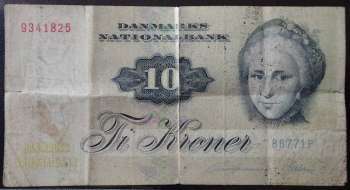 The theme of the notes is paintings by Jens Juel (1745–1802) of various more or less famous people on the front sides and common animals in Denmark on the back sides. The Common Eider (Somateria mollissima) is a large (50–71 cm body length) sea-duck that is distributed over the northern coasts of Europe, North America and eastern Siberia. It breeds in Arctic and some northern temperate regions, but winters somewhat farther south intemperate zones, when it can form large flocks on coastal waters. It can fly at speeds up to 113 km/h (70 mph). Folded into 8 quarters, therefore lines are visible. Three major tears are visible and one major pinhole. 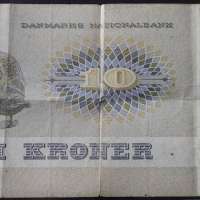 This banknote was a given as a present from Benny Olsen, tusind tak!